When living in London, I found this small ceramic pot at a stall in Portobello Road. With 18 small holes covering the tiny pot, I was clueless as to its purpose until the woman selling explained that it was used to force crocus bulbs. Always finding a way to justify another addiction (ceramic containers this time), I purchased it, swearing to use it. 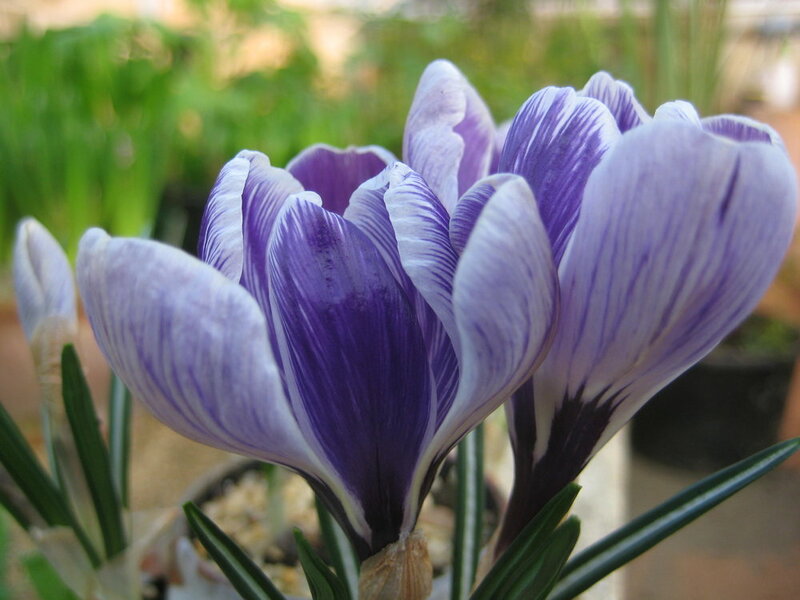 During the end of autumn of last year, I purchased five dormant bulbs at the Colombia Road Flower Market for just a few pounds, choosing Crocus vernus 'Pickwick', a large flowering early spring bulb, for my project. The whole process from beginning to end took around 3 months, though I am sure this could be done a bit quicker when done again. All the materials I used was a container, the 5 dormant Crocus 'Pickwick', a small amount of moss, some free draining potting media, and a bit of gravel for the top. Since I only had 5 bulbs (corms to be exact) and there are 18 openings, I started by lining the extra openings in the pot with a small amount of moss to prevent the potting media from spilling out. Adding soil as I went, I spaced 4 bulbs around the outside and one on top, always making sure the growing point was facing outwards or upwards. Then a small amount of gravel was placed on top to prevent soil from splashing when watered, help retain heat, and for aesthetic purposes. After completion, the pot was given a small drink of water, sat in the cold potting shed overnight and then placed outside. Thus begins the necessary first step of the process, the cold treatment. In a few weeks' time, green tips began emerging from the gravel topped pot and I knew that it wasn't long before they could be moved to inside the glasshouse. The glasshouse at Gravetye, usually warmer than outside, was heated only during periods of extreme cold and had one heat lamp that was used only in the evenings. If it was a regularly heated glasshouse, the process would have been much quicker (If moving the pot from the outside cold treatment, it is best to not put it in too hot of a glasshouse immediately, or the plant will grow too quickly and leggy, resulting in a poor flower display). A few times throughout the process I gave a small amount of water to the pot, always making sure that the media was dry first to prevent overwatering, which could rot the bulbs. When they were placed inside, the green strappy foliage with its white midribs emerged completely before the blooms. At eleven weeks into the process, the blooms themselves had fully emerged, almost dwarfing the container. When I started, I wondered if 5 bulbs was too many for this small pot, but am now eager to try again with more bulbs planted, though I am not sure as many as 18 would work due to spacing issues. The warmer the temperature was, the more open the blooms would get, which is a reason 18 might be too many in this container, considering how multiple blooms emerge from a single bulb. With no doubt, anyone who saw them in this open state would comment on their beauty, clearly thirsty for color.